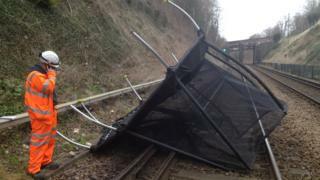 Damage caused by storms Ophelia and Brian has disrupted train services on Monday. In north Wales, Arriva Trains Wales' route from Llandudno Junction to Blaenau Ffestiniog has been suspended because of urgent tunnel repairs. Strong winds battered coastal areas over the weekend as storms continued. Arrive Trains Wales said it was making repairs and safety checks across its network, with services expected to be amended. It urged people to check before travelling, with some trains also set to run with fewer carriages.